After losing 4% last week the SPX lost another 2% this week. From the top at 1150 it's already dropped 80 points and all that in just eight trading days! If it keeps this pace we will see new lows by the end of March. LOL. 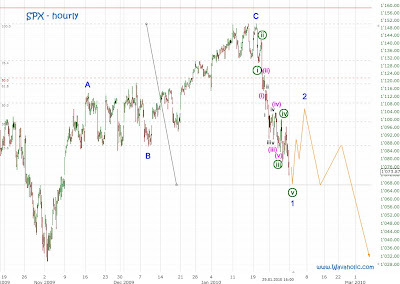 Last weekend I expected the low of wave 1 somewhen early in the week and then a rally for the rest of the week up to 1120. But for some reason the dip buyers were MIA and hence the SPX went lower. At the end of the week it was clear that we saw for the SPX what I expected to see only for the Nasdaq. The counts for the Nasdaq and the SPX are now similar and they both need one more low to form a nice impulse. Then, I expect a bounce in a wave 2. I hope it to reach at least 1100, 1120 would be even better to rebuy the shorts I sold this week.